General recommendations and organism-specific therapeutic regimens for myocarditis are provided below, including those for viral [1, 2, 3, 4] and bacterial organisms. [2, 3, 5] Special considerations are also discussed. Obtain hemodynamic stability with vasopressors and inotropic agents, if needed. Use diuretics and vasodilators if high ventricular filling pressures are noted on echocardiography. Consider a left ventricular assist device, transplantation, or both in patients with severe disease. Historically, the Dallas criteria have been used for histologic diagnosis, although their utility is questioned. Elevated troponin I (>0.1 ng/mL) is highly specific for the diagnosis of myocarditis; the creatine kinase–muscle-brain (CK-MB) fraction and the total creatine kinase (CK) level are not useful. Echocardiography is recommended as the initial imaging test of choice in suspected myocarditis. Cardiac magnetic resonance imaging (MRI) is useful to differentiate between myocarditis and other cardiomyopathies, as well as to target endomyocardial biopsy sites. 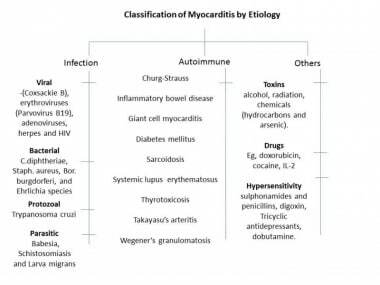 Classification of myocarditis by etiology. See the acute myocarditis flow chart (first image below) and subacute myocarditis flow chart (second image below). Studies investigating intravenous immunoglobulin (IVIG) therapy in adults with acute myocarditis and acute myopathy have failed to show any type of usefulness in treatment during an acute episode. In patients with HIV infection, a long-term follow up (at 5 y) with echocardiogram has shown that 8% show dilated cardiomyopathy changes. However, it is unknown if ACEIs and beta-blockers are effective in these patients. Hypersensitivity-related myocarditis often manifests as infiltration with lymphocytes, histocytes, and eosinophil, and sometimes it results in sudden death from complications of myocarditis. Syncope with ventricular arrhythmia and cardiac block should be treated with hospital admission with continuous echocardiogram monitoring and conservative management, similar to acute arrhythmias. [Guideline] Yancy CW, Jessup M, Bozkurt B, et al. 2013 ACCF/AHA Guideline for the Management of Heart Failure: A Report of the American College of Cardiology Foundation/American Heart Association Task Force on Practice Guidelines. J Am Coll Cardiol. 2013 Jun 5. [Medline]. Magnani JW, Dec GW. 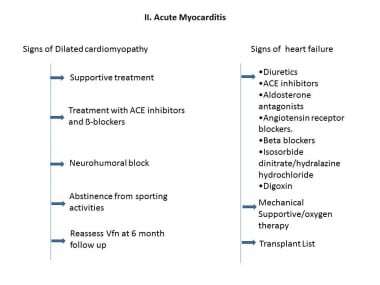 Myocarditis: current trends in diagnosis and treatment. Circulation. 2006 Feb 14. 113(6):876-90. [Medline]. Knowlton KU, Oxman MN, Savoia MC. Myocarditis and pericarditis. Mandell, Douglas, and Bennett, eds. Principles and Practice of Infectious Diseases. 7th ed. Philadelphia, Pa: Churchill Livingstone; 2009. Vol 1: Chapter 8. [Guideline] Hunt SA, Abraham WT, Chin MH, et al. 2009 focused update incorporated into the ACC/AHA 2005 Guidelines for the Diagnosis and Management of Heart Failure in Adults: a report of the American College of Cardiology Foundation/American Heart Association Task Force on Practice Guidelines: developed in collaboration with the International Society for Heart and Lung Transplantation. Circulation. 2009 Apr 14. 119(14):e391-479. [Medline]. Eshaghian S, Horwich TB, Fonarow GC. Relation of loop diuretic dose to mortality in advanced heart failure. Am J Cardiol. 2006 Jun 15. 97(12):1759-64. [Medline]. Gallager R, Luttik ML, Jaarsma T. Social Support and Self-care in Heart Failure. J Cardiovasc Nurs. 6:439-45. [Medline]. Schultz JC, Hilliard AA, Cooper LT Jr, Rihal CS. 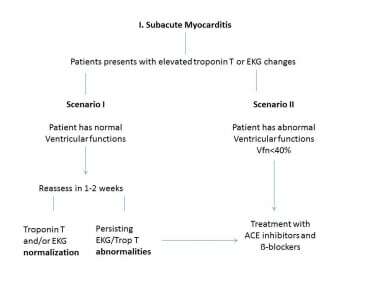 Diagnosis and treatment of viral myocarditis. Mayo Clin Proc. 2009 Nov. 84(11):1001-9. [Medline]. [Full Text]. Sagar S, Liu PP, Cooper LT Jr. Myocarditis. Lancet. 2012 Feb 25. 379(9817):738-47. [Medline]. Kimberlin DW, Lin CY, Sánchez PJ, et al. Effect of ganciclovir therapy on hearing in symptomatic congenital cytomegalovirus disease involving the central nervous system: a randomized, controlled trial. J Pediatr. 2003 Jul. 143(1):16-25. [Medline]. [Guideline] Liu C, Bayer A, Cosgrove SE, et al. Clinical practice guidelines by the infectious diseases society of america for the treatment of methicillin-resistant Staphylococcus aureus infections in adults and children: executive summary. Clin Infect Dis. 2011 Feb 1. 52(3):285-92. [Medline]. [Guideline] Centers for Disease Control and Prevention. Diphtheria. Available at http://www.cdc.gov/diphtheria/clinicians.html. Accessed: Sept. 25, 2014. [Guideline] Centers for Disease Control and Prevention. Schistosomiasis. Available at http://www.cdc.gov/parasites/schistosomiasis/health_professionals/index.html#tx. Accessed: Sept. 24, 2014. [Guideline] World Health Organization. WHO-Preventive in human helminthiasis. Available at http://whqlibdoc.who.int/publications/2006/9241547103_eng.pdf. Accessed: Sept. 25, 2014. [Guideline] Centers for Disease Control and Prevention. American Trypanosomiasis (also known as Chagas Disease). Available at http://www.cdc.gov/parasites/chagas/health_professionals/index.html. Accessed: Sept. 25, 2014.
Cooper LT Jr. Myocarditis. N Engl J Med. 2009 Apr 9. 360(15):1526-38. [Medline]. Sato Y, Yamada T, Matsumori A. Hepatitis C virus and cardiomyopathy. Matsumori A, ed. Cardiomyopathies and Heart Failure: Biomolecular, Infectious, and Immune Mechanisms. Boston, Mass: Kluwer Academic Publishers; Vol 92: 2519–25. Matsumori A, Matoba Y, Sasayama S. Dilated cardiomyopathy associated with hepatitis C virus infection. Circulation. 1995 Nov 1. 92(9):2519-25. [Medline]. Domanski M, Norman J, Pitt B, Haigney M, Hanlon S, Peyster E. Diuretic use, progressive heart failure, and death in patients in the Studies Of Left Ventricular Dysfunction (SOLVD). J Am Coll Cardiol. 2003 Aug 20. 42(4):705-8. [Medline]. Rogers HL, Marshall J, Bock J, et al. A randomized, controlled trial of the renal effects of ultrafiltration as compared to furosemide in patients with acute decompensated heart failure. J Card Fail. 2008 Feb. 14(1):1-5. [Medline]. Lieback E, Hardouin I, Meyer R, Bellach J, Hetzer R. Clinical value of echocardiographic tissue characterization in the diagnosis of myocarditis. Eur Heart J. 1996 Jan. 17(1):135-42. [Medline]. Pepi M, Marenzi GC, Agostoni PG, et al. Sustained cardiac diastolic changes elicited by ultrafiltration in patients with moderate congestive heart failure: pathophysiological correlates. Br Heart J. 1993 Aug. 70(2):135-40. [Medline]. [Full Text]. Liang KV, Hiniker AR, Williams AW, Karon BL, Greene EL, Redfield MM. Use of a novel ultrafiltration device as a treatment strategy for diuretic resistant, refractory heart failure: initial clinical experience in a single center. J Card Fail. 2006 Dec. 12(9):707-14. [Medline]. Wojnicz R, Nowalany-Kozielska E, Wojciechowska C, et al. Randomized, placebo-controlled study for immunosuppressive treatment of inflammatory dilated cardiomyopathy: two-year follow-up results. Circulation. 2001 Jul 3. 104(1):39-45. [Medline]. Griffiths PD, Hannington G, Booth JC. Coxsackie B virus infections and myocardial infarction. Results from a prospective, epidemiologically controlled study. Lancet. 1980 Jun 28. 1(8183):1387-9. [Medline]. Geri G, Wechsler B, Thi Huong du L, et al. Spectrum of cardiac lesions in Behçet disease: a series of 52 patients and review of the literature. Medicine (Baltimore). 2012 Jan. 91(1):25-34. [Medline]. Margari ZJ, Anastasiou-Nana MI, Terrovitis J, et al. Indium-111 monoclonal antimyosin cardiac scintigraphy in suspected acute myocarditis: evolution and diagnostic impact. Int J Cardiol. 2003 Aug. 90(2-3):239-45. [Medline]. Laissy JP, Messin B, Varenne O, et al. MRI of acute myocarditis: a comprehensive approach based on various imaging sequences. Chest. 2002 Nov. 122(5):1638-48. [Medline]. Aamer Rehman, MRCP, MD, Fellow, Division of Cardiology, University of Louisville Medical Center for help with reviewing the article.